What is the COUNTIFS Function? The COUNTIFS function is categorized under Statistical functions. 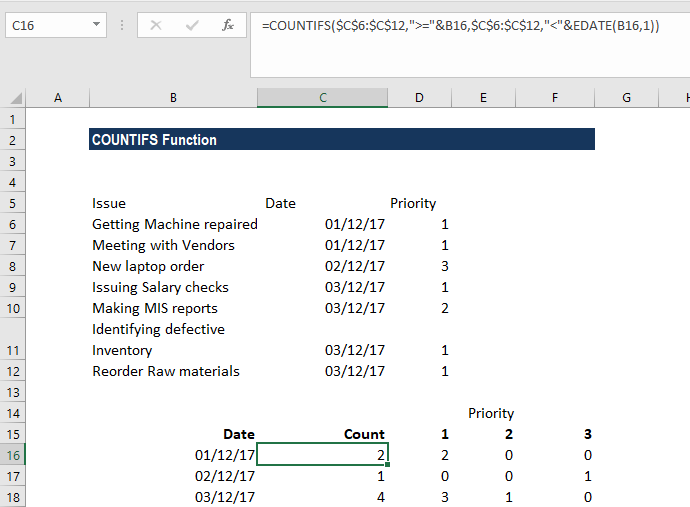 COUNTIFS will count the number of cells that meet a single or multiple criteria in the same or different ranges. The difference between COUNTIF and COUNTIFS is that COUNTIF is designed for counting cells with a single condition in one range, whereas COUNTIFS can evaluate different criteria in the same or different ranges. While doing financial analysisFinancial Analyst Job DescriptionSee a real Financial Analyst Job Description including all the skills, experience, and education required to be the successful candidate for the job. Perform financial forecasting, reporting, and operational metrics tracking, analyze financial data, create financial models, COUNTIF helps in doing a quick analysis. For example, we are given a list of tasks to be completed by a department, and the dates and priority of each task. 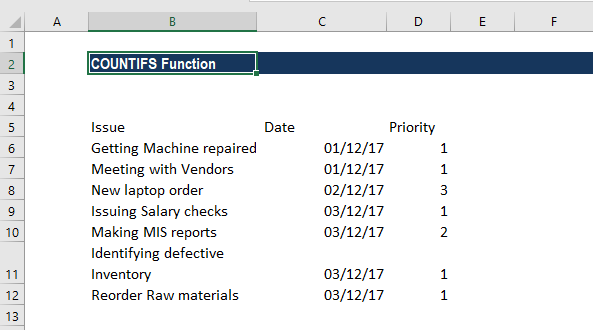 In such scenario, we can prepare a table showing the date, count of each task and their priority using the COUNTIFS function. Criteria_range1 (required argument) – It is the first range that would be evaluated with the associated criteria. Criteria_range2, criteria2, … (optional argument) – The additional ranges and their associated criteria. The function allows up to 127 range/criteria pairs. It is a numeric value. It can be an integer, decimal, date, time, or logical value. A text string. It may include wildcards. Wildcards can be a ? (question mark) or an * (asterisk). A ? matches any single character, whereas, * matches any sequence of characters. If we wish to actually find the ? (question mark) or * (asterisk) character, we need to type the ~ symbol before this character in our search. How to use the COUNTIFS Function? 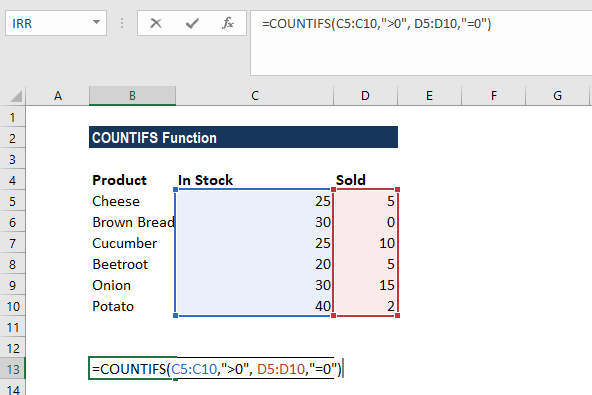 As a worksheet function, the COUNTIFS function can be entered as part of a formula in a cell of a worksheet. 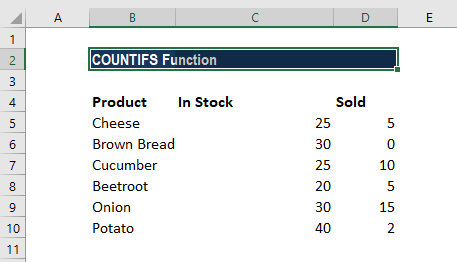 We want to get a count of items that are in stock (value in column C is greater than 0) but remain unsold (value is column D is equal to 0). Let’s create count by month. For that, we need to use two functions COUNTIFS function and the EDATE function with two criteria. The list of issues is in Column B. Each issue includes a date (column C) and priority (column D). Starting in cell B15, we prepared a summary table that shows a total count per day and a total count per day per priority. The first column of the summary table is a date. 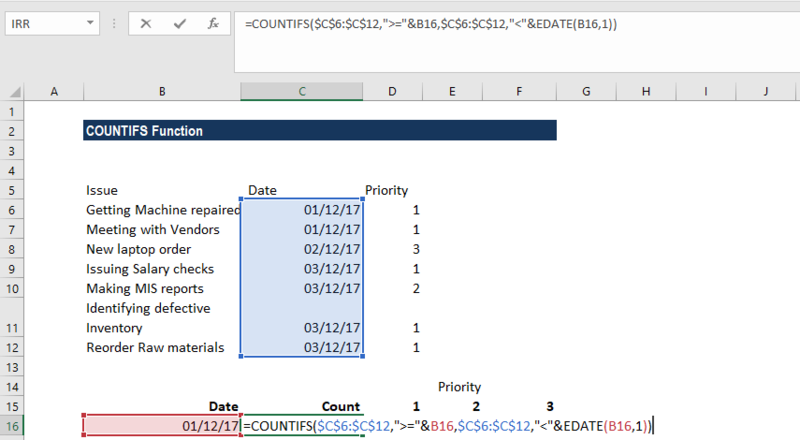 With the actual dates in column C, we can easily construct the criteria we need using the date itself, and a second date created with the EDATE function. 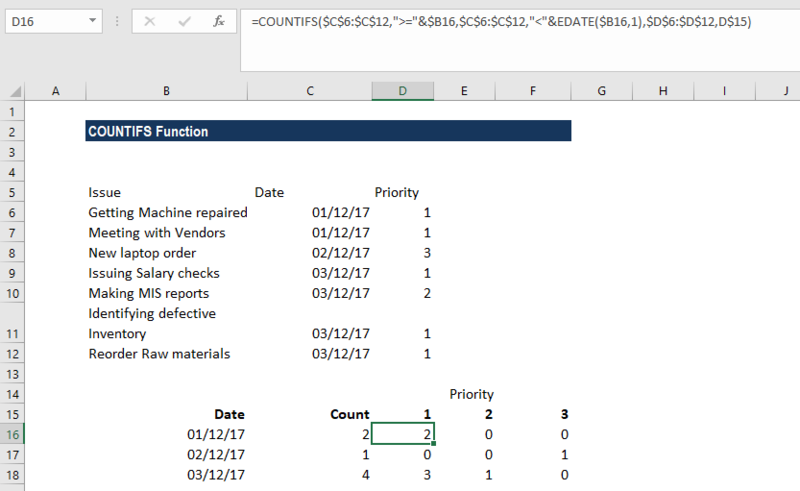 The formula returns a count by date but broken down by priority, which is picked up directly from row 6. 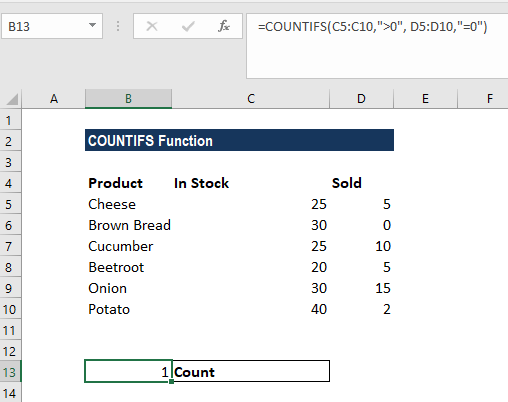 COUNTIFS is available from MS Excel 2000. The given criteria_range arrays are not equal in length. The supplied criteria arguments are text strings that are greater than 255 characters long. Each additional range should include the same number of rows and columns as the criteria_range1 argument, although it is necessary that they aren’t adjacent to each other.